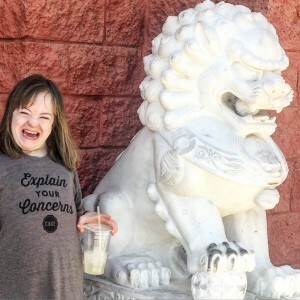 This was followed by near-tears as Sophie realized that she can’t wear a “Spread the Word to End the Word” tee shirt — or a tee shirt that says anything else, for that matter. Dress code. I would be lying if I didn’t admit it was a tough weekend. 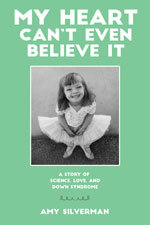 I was reminded more times than I can count that in the course of research for my book, I never did figure out why the brains of people with Down syndrome are structured such that a certain brand of maddening stubbornness is a common trait. Combine that with hormones and you have an almost 13-year-old who refuses to wear a bra (now that she finally needs one), demands a particular and sadly elusive shrimp ball dish at dim sum (very loudly and for 15 minutes straight, maybe longer, I lost count), and hollers “Hey Mom” at me from the back seat pretty much whenever we are in the car — for the duration of the trip. “Hey Mom?” she asked yesterday afternoon. “WHAT? !” I asked, wondering how many times before I drive the car off the road and end it all. The kid floors me. In a good way, that time. And within 30 seconds I was annoyed again, as what I considered to be reasonable, thoughtful suggestions (mother’s helper, artist, dancer, teacher, hair stylist, nail tech, lawyer) were vetoed with increasing frustration. But for a moment I was reminded why — at least part of why — Sophie gives me such a tough time. The world gives her a tough time. The weekend wasn’t a complete bust. We cuddled, laughed, played with our poodle, tried to make hamantaschen for the Jewish holiday Purim, watched the second half of Pitch Perfect 2, finally bought Sophie new glasses, and I did manage to find some steamed wontons she would eat for lunch yesterday. As we were leaving dim sum, she paused by her favorite statue to do her favorite imitation, and we all cracked up. Sophie appeared at my side, asking again if she can wear a special shirt like her sister (who, unlike Sophie, who goes to a tough public school, attends a charter arts school and can pretty much wear whatever she likes, short of a bikini). I considered the hard line. Then reconsidered. She smiled. They won’t, she told me as she headed off to her bedroom, and what she said as she left made me smile, too. That right there is what you call a MIC DROP. You amaze me, oh gifted one! Thank you for sharing your world with such honesty, humility and humor–and for ending my Monday with a smile!